Dragonflies and damselflies, insects in the scientific order Odonata, inhabit water areas throughout the United States. In fact, the presence of Odonata species in an area provides an indicator of water quality. Size differentiates damselflies and dragonflies, with dragonflies (suborder Anisoptera), the larger group of the two. Dragonfly identification, while not as popular as butterfly identification, continues to draw a crowd of enthusiasts. Dragonfly identification and damselfly identification starts by noting that in addition to size, wing position also helps differentiate between the two. Usually dragonflies rest with their flat, like an airplane. Most damselflies at rest keep their wings closed against their body or a bit above the body. 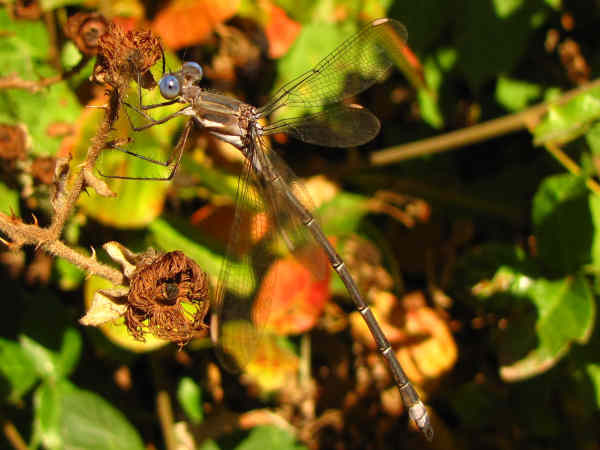 Spreadwing Damselflies represent the exception to the general wing position rule. 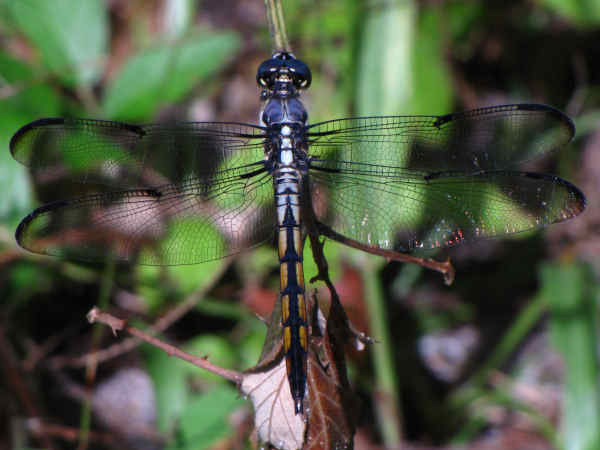 United States dragonfly diversity remains fairly strong, with close to 350 species in the seven different dragonfly families documented to date. Over one-third of native dragonfly species, approximately one hundred and ten (110) belong to the family Libellulidae, or skimmers, the ever present dragonflies at local ponds. Press on a button to discover more about species from selected dragonfly families. Twenty-six different genera, along with inter-genus diversity makes a comprehensive identification tips guide to skimmers problematic. The large, often blue spotted, and indefatigable fliers found around the ponds, streams and lakes of the United States, go by the common name darners. While the family breaks down into approximately forty different species, divided into thirteen genera, almost forty per cent of the species belong to the genus Aeshna, or Mosaic Darners. While species within specific genera often display slightly different physical characteristics, many darner species also share some common physical characteristics. For convenience sake, think of darner identification in terms of two general rules of thumb. First, body color serves as the distinguishing gender detail. Most males show blue patterns on otherwise darker colored thorax and abdomen. Females often, but not always, produce similar patterns in shades of yellow and green. 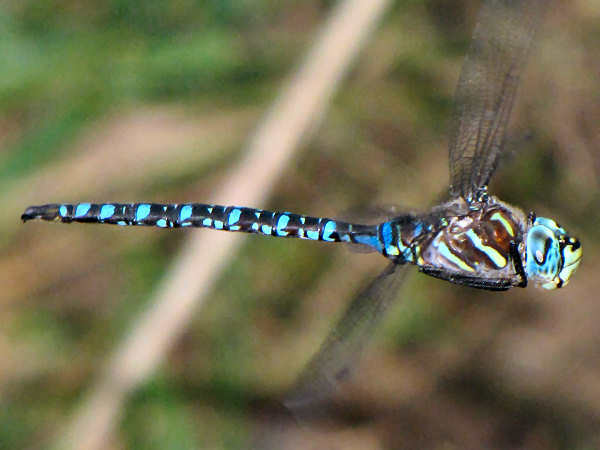 The absence or presence of thoracic stripes (top and side), along with their shape when present, serve as the second leading mosaic darner identification clue. 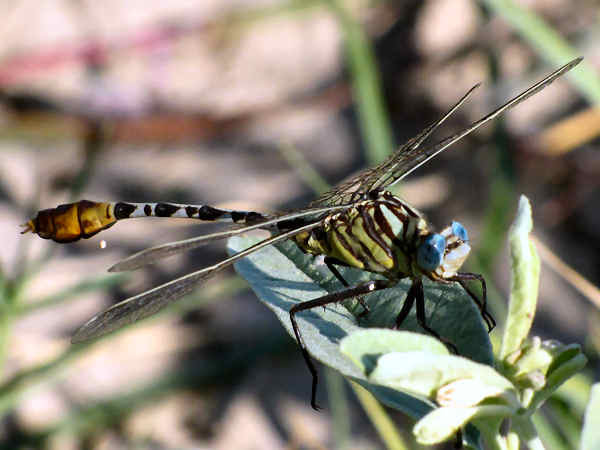 With only eight or nine species found in the United States, Spiketails, the common name for dragonflies in the Cordulegastridae family, rank among the least populous of the dragonfly families. All the species belong to the Cordulegaster genus, and six of them are indigenous to forest and stream areas east of the Rocky Mountains. Cordulegaster species are characterized as large dragonflies with thin black or dark brown abdomens covered with a bright yellow pattern. Like their fellow Aeshnoidea, the darners, they spend most of their day flying. Coming across one that is perching in the sun is always a treat. 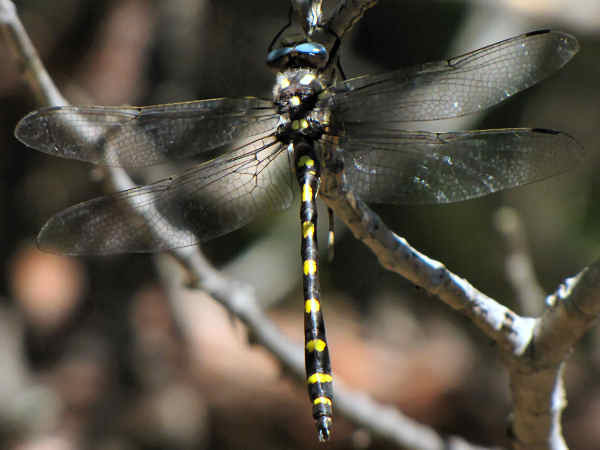 The Pacific Spiketail (Cordulegaster dorsalis), pictured above, is the most common Western species. 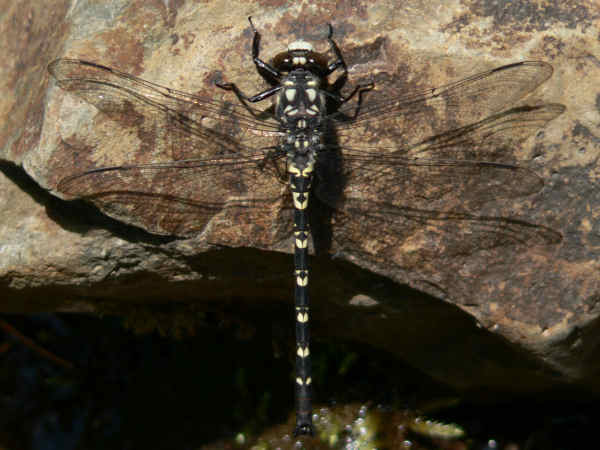 Second only to the skimmers (Liebellulidae) in number of species, approximately one hundred clubtail species (Gomphidae) fly around the water areas of North America. Some, but not all clubtail species get the common name based on the, comparatively, irregular appearance of the tail at the bottom of the abdomen. 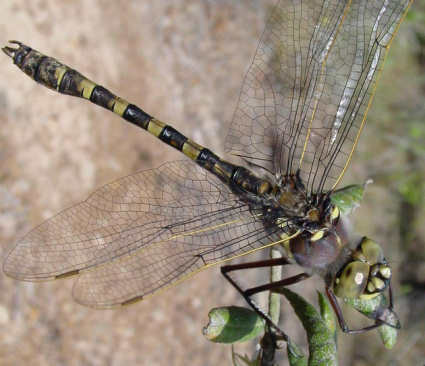 Revisions within dragonfly taxonomy change, as scientists learn more about species and genera. Currently, clubtails divide into fourteen genera. Species in the Gomphus genus account for perhaps one-third of the entire North American Gomphidae population. Petaltails, native dragonflies of the Petaluridae family, are believed to be the oldest of the dragonfly families. Fossil records date them back one hundred and fifty million years. In total, only eleven species are documented world wide, two of which are native to the United States. The Black Petaltail (Tanypteryx hageni), pictured above, is found along the West Coast, mostly in sunny habitats near streams or rivers. Emeralds (family Corduliidae), or the green-eyed skimmers, fly in most areas of the United States, although species diversity is greatest in the north. The American Emerald (Cordulia shurtleffii), one of three globally identified Cordulia species is the sole North American species. 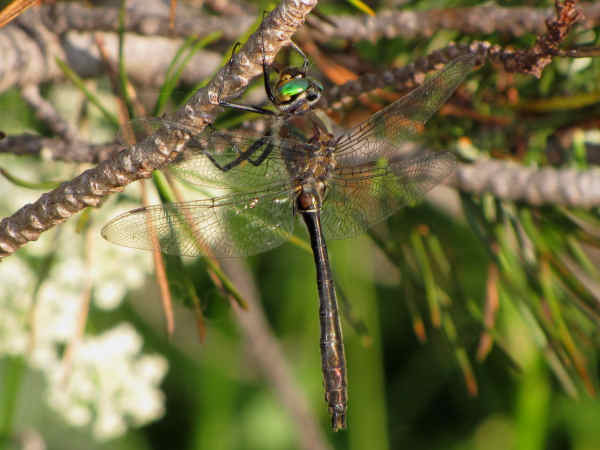 Found in lake and bog habitats near wooded or forested areas, they are known as an early bird dragonfly that flies from early spring through late summer, depending on altitude. Their habit of cruising up and down roads and rivers explains the common name for dragonflies in the family Macromiidae, commonly called cruisers. Nine species divided into two genera fly around the United States. The picture shows the Florida Cruiser. The two North American genera of broadwinged damselflies (Calopterygidae) are known for their large size and showy colors. The wide wings on the River Jewelwing (Calopteryx aequabilis), explains its placement in the broad-winged damselfly family. It’s one of a handful of Jewelwing species, and fairly common in the northern half of the United States. 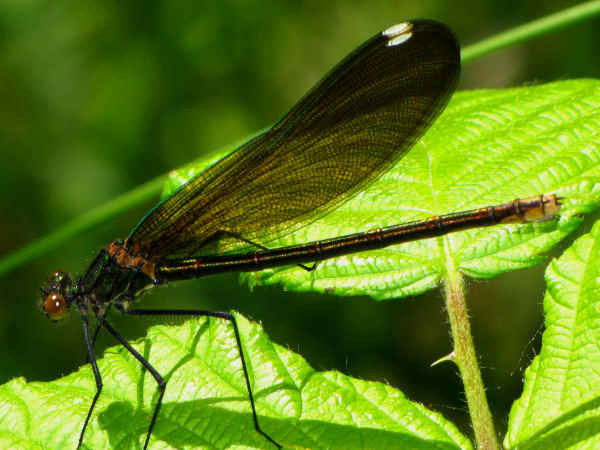 River Jewelwings are typically the largest damselflies in any given area, and they generally display physical characteristics such as metallic green bodies and large, spotted wings. Females, like the one in the top picture also have white pterostigmas, or wing tips on the dark spots. About twenty spreadwing damselfly species fly in North America. Identifying one can be a fairly easy task given the fact that they prominently display open wings while at rest. Like most damselflies, they prefer still or slow moving water habitats, where they perch and fly in search of both food and mates. Narrow-winged damselflies account for the bulk of both the world’s and the native damselfly population. Scientists estimate that approximately 1,000 of the world’s 2,500 damselfly species belong to the family Coenagrionidae. In the United States, Coenagrionidae account for approximately 100 of the 125 identified species. Sometimes called pond damselflies, they are typically found near ponds and other slow moving water bodies. As a group they tend to be weak flyers. 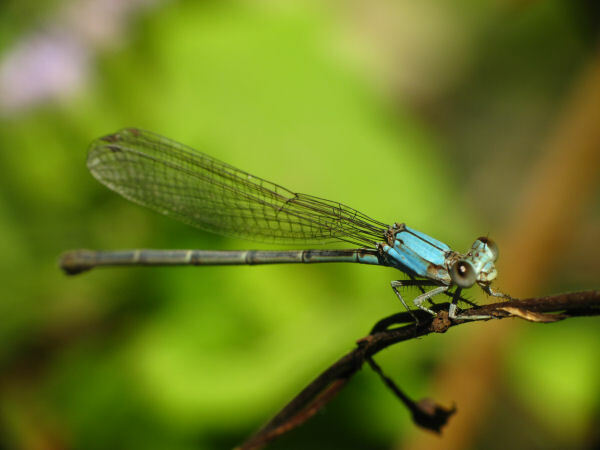 Most domestic species belong to one of three genera, American Bluets (Enallagma), Forktails (Ischnura) and Dancers (Argia). Fossil records date the dragonfly back 300 million years. The largest dragonfly recorded from fossil records had a wing span of about two and one-half feet. There are approximately 5,000 different species of dragonflies in the world today, split almost evenly between true dragonflies and damselflies. Most species live in tropical areas, however they can be found in every continent except Antarctica. The United States hosts approximately 450 different Odonata species. Dragonfly life span extends anywhere from about six months to several years. Most of the dragonfly life span is spent in the water as a nymph. During this period, which can last up to a couple of years, it sheds its skin many times. Finally it crawls onto land to break out of its skin as a full fledged dragonfly. Dragonflies get categorized as beneficial insects because they eat so many harmful insects such as mosquitoes, gnats, ants termites, along with other insects and arachnids. Dragonflies do not harm people. They do not bite and they do not sting. Estimates differ on dragonfly flyig speed, with estimates ranging between 30-60 mph. Dragonflies can fly like a helicopter, moving in all directions, forward, backward, up and down. They can also hover. Sight is the dragonfly’s most important sense. Each eye can contain up to 30,000 tiny lenses.